Workable is the most popular all-in-one recruiting software for small and medium enterprises. Available for desktop and mobile, over 6000 companies globally are using Workable to streamline their recruiting. From sourcing and attracting candidates to applicant tracking and evaluation, the Workable platform enables smooth collaboration, resulting in more viable candidates and a faster time to hire. • Fast evaluations: Gather team feedback with a fast thumbs up/down evaluation to decide when candidates should progress to the next stage. • Interview templates: Create templates for use per company or per department. Add custom questions for individual roles. 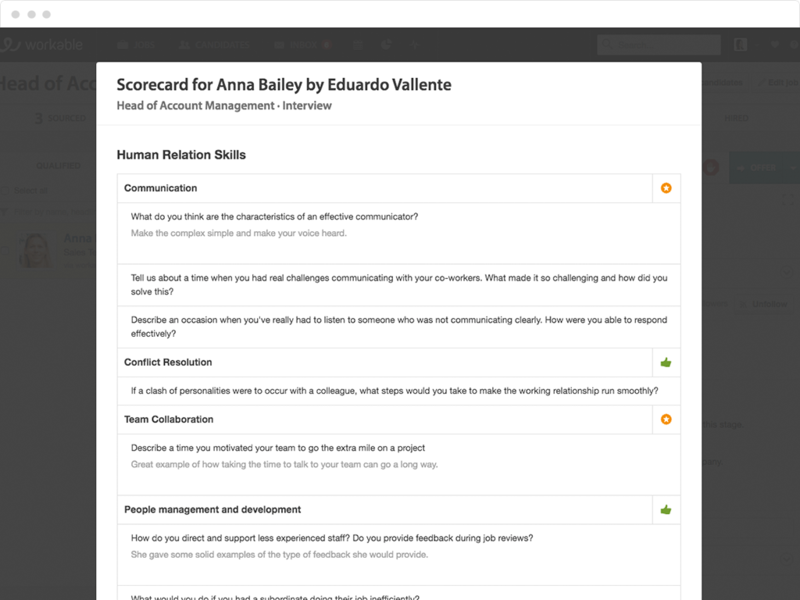 • Interview scorecards: Generate scorecards to gather structured, actionable feedback from your hiring team. • Scorecard results: View feedback from each hiring team member, or in aggregate for a fast overview. • Hiring Dashboard: Get an up-to-date snapshot of your hiring status and see how many candidates are at each stage for every job. • Candidate profiles: See all the information about a candidate in one place, from resumes and files to team comments and evaluations. • Trackable communication: Smart email sync with Gmail, Outlook, Yahoo or your preferred email application means all communication is tracked in Workable. • Bulk actions: Increase your productivity with bulk actions, including emails, rejections and candidate progression. • Job boards: Attract more candidates for every role by expanding your reach. 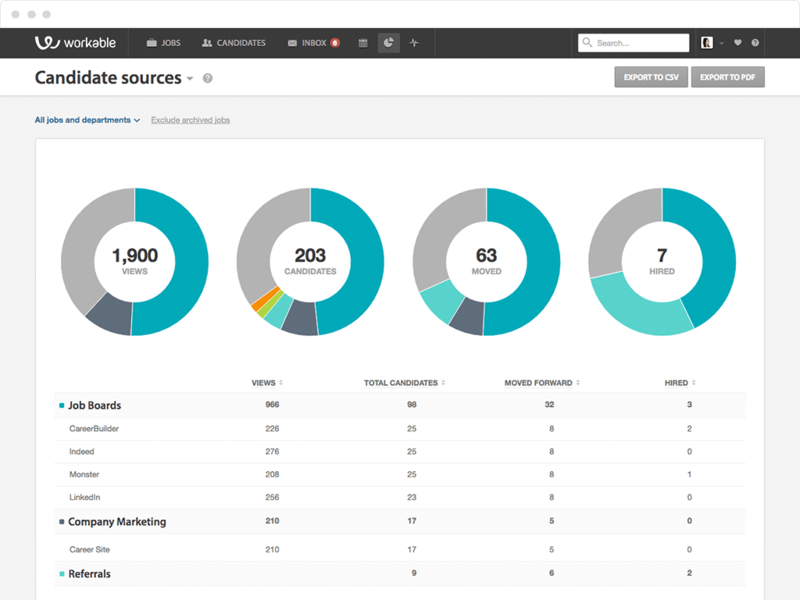 Use Workable to post to multiple free and premium job boards with a single submission. • Social networks: Talk directly to your biggest fans on LinkedIn, Google+, Facebook and Twitter by posting jobs directly from Workable. • Career pages: Whether you’re a developer or an HR professional, create a branded careers page and custom application form for every job. • Talent sourcing: Accelerate talent sourcing with People Search, a Chrome extension. 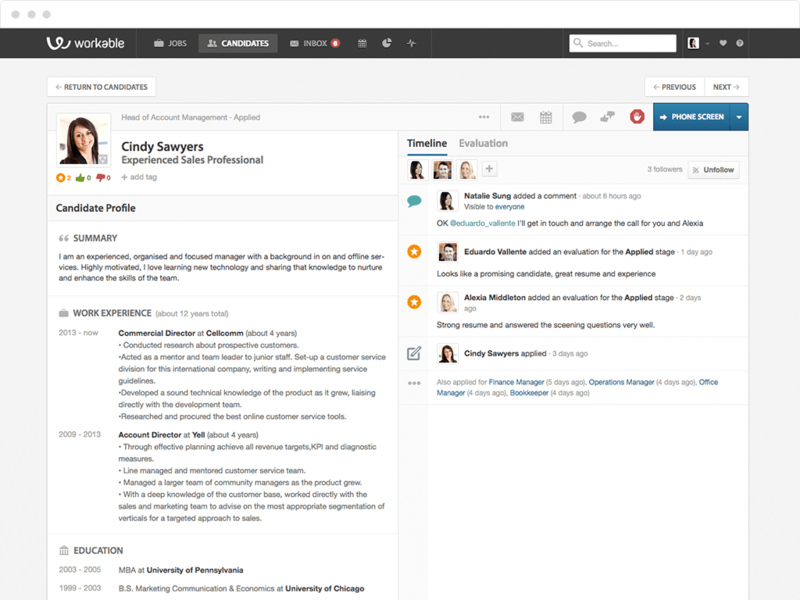 Save hours of research time with instant email and resume look-up. Find rich candidate profiles and reach out to prospects directly with a personalized email. • Hiring velocity: Track the average time it takes candidates to move through the pipeline. • Productivity: See the activity of every hiring team and track their productivity over time. • Time to hire: View time taken to fill a job and the time from application to successful hire. • Candidate sources: Track the source of candidates from job boards to recruiters. The Workable integration with BambooHR seamlessly exports candidate information to your BambooHR account. When you hire a candidate, their details are automatically transferred to BambooHR as a new employee. Hire from your desk in the office or the smartphone in your pocket.